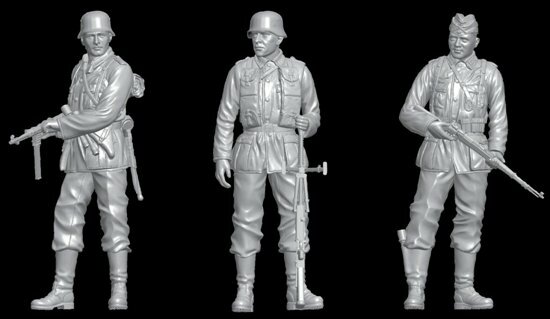 The poses of these three soldiers are designed to be universally versatile. The trio is standing in relatively relaxed poses. A close examination of these molded plastic figures reveals how impeccable all the computer-generated detail is. Whether it’s their faces, hands, uniforms or belts, these figures are truly full of intricate detail. To make this first such figure set even more appealing, the box includes a number of BONUS accessories made of DS materials. 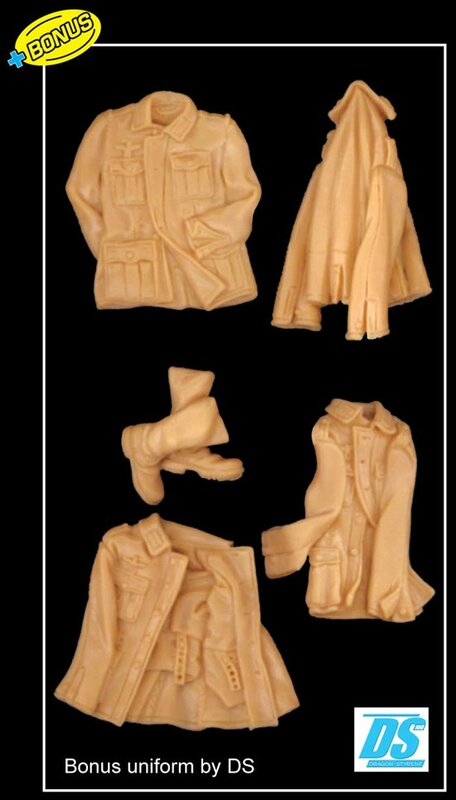 These are all bonus items in addition to the hi-tech figures themselves. While these German soldiers might be just standing around, the technology that Dragon used to create them has leapt forward by a generation! Dragon already utilizes high-tech engineering processes to create its kits, but now the newest-generation technology is influencing – and improving – its 1:35 scale range of figures. So just what is this newest technological leap forward? It’s figure sets that are wholly designed using computers. In other words, no master figure is produced or needed. From initial design through to final tooling using advanced computer programs, 100% of the detail is retained in the computer files. 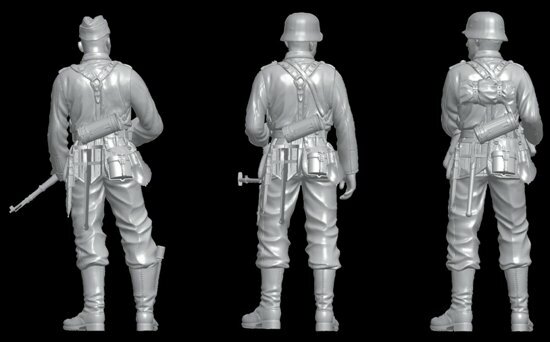 Indeed, the results are evident in Dragon’s newest set of 1:35 scale German infantry. 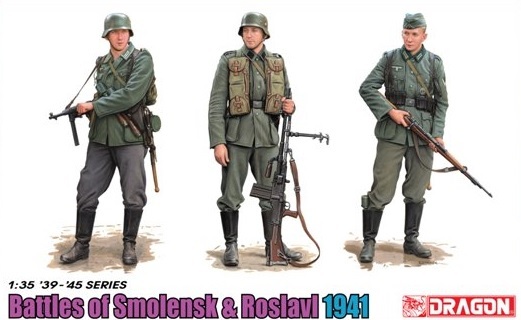 here are three figures in this new set depicting soldiers fighting in the Battle of Smolensk and Roslavl in 1941. After enormous success during the invasion of Russia, German forces were delayed at Smolensk from 10 July to 10 September 1941. Although a Russian counterattack there failed, this defensive battle was critical to Russia as it slowed the German advance and made reaching Moscow that much more difficult.